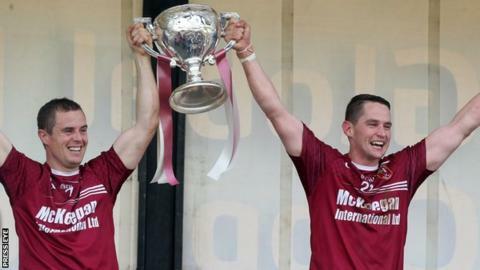 Cushendall bounced back from a nine-point half-time deficit to beat Ballycastle 2-16 to 1-15 in an exciting Antrim SHC final at Dunloy on Sunday. The Seasiders trailed 1-11 to 0-5 at the interval but recovered to secure their 13th title by four points. Meanwhile Ballycran scored 1-4 in the last 10 minutes to clinch victory over Ballygalget in the Down SHC decider. Stephen McAree's side sealed their first Down crown since 2011 with the final score reading 1-15 to 0-16. Ballygalget, who had seen off Portaferry 2-13 to 0-18 in their semi-final, had led 0-11 to 0-6 at the interval. A goal from substitute Brendan Ennis two minutes from time proved enough for Ballycran to run out the victors. Ballycastle, conquerors of Dunloy in the last four, were attempting to bridge a 29-year gap, as they took on the holders Cushendall. Ballycastle made a good start and raced into a five-point lead, before Neil McManus scored Cushendall's first point in the 12th minute. A goal from Saul McCaughan saw the champions trail by nine points at the interval, but they made good use of their wind advantage in the second half. After the break, Donal McNaughton found the net with his first touch after coming on as a substitute and a further goal by Eoghan Campbell brought Cushendall level after great work by Conor Carson. A Christy McNaughton point gave his side the lead for the first time and late points from McManus and Carson ensured victory for their sides.